Plymouth might not be the first brand that comes to mind you when you think "pickup truck," but in fact there were plenty of Plymouth-branded trucks sold in the pre-World War II period, and you could get a badge-engineered Ramcharger called the Plymouth Trail Duster in the Early Malaise Era (yes, they just loved that Duster name at Chrysler). 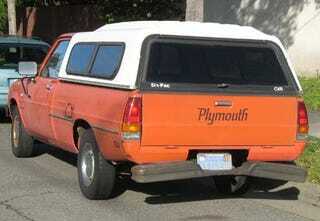 And you want to talk confusing branding, let's look at this '80 Arrow pickup. It's a Mitsubishi Forte with Plymouth Arrow badging... not to be confused with the Plymouth Arrow car, which was a rebadged Mitsubishi Celeste. All we can figure is that someone at Chrysler really, really liked the Arrow name and decided to apply it to any vehicle that would hold still long enough to get the plastic emblems glued to its flanks. Not that it matters much, since the Arrow name was dropped by '82 and all the rebadged Fortes were sold as Dodge Ram 50s after that. Meanwhile, Mitsubishi started importing them as Mighty Maxes. Anyway, as a rear-wheel-drive Japanese small pickup truck with the Astron four-banger under the hood, the Arrow truck was a pretty decent machine, regardless of head-clutching branding confusion.